Opponents of the Dakota Access Pipeline celebrated a win this week when a federal judge ordered the US Army Corp of Engineers to reconsider its environmental review of the DAPL, which in the future might lead to halting pipeline operations. The announcement was welcome news after months in which the pipeline was moving forward. To review, it’s been almost five months since President Trump’s executive orders authorized the completion of the Dakota Access Pipeline, and nearly four months since the Standing Rock water protectors were evicted after enduring online harassment, assaults with “less lethal” weapons such as tear gas, rubber bullets, flash-bang grenades, and blasts from police water cannons in the freezing North Dakota winter. Energy Transfer Partners retained military contractor TigerSwan to spy on encampments and coordinate a broad militaristic response to the water protectors. We learned in February that companies behind the pipeline reported “thousands of gallons of oil spilled in dozens of industrial accidents” over the last two years. Then, in early April, the DAPL itself leaked for the first time before it was even fully operational. Finally, oil began flowing through the pipeline earlier this month, the same day that Trump announced that the United States would be pulling out of the historic Paris Agreement. As Jimmy Tobias wrote at The Nation back in March, much of the recent organizing around the DAPL is focused on getting cities to starve the project financially by divesting from banks that are funding the pipeline. They had their first victory back in February, when thanks to the advocacy of the Standing Rock Sioux and allies like councilwoman Kshama Sawant, the city of Seattle passed an ordinance prohibiting local government from dealing with Wells Fargo. The bank, whose business with the municipality amounted to $3 billion annually, is one of 15 banks directly invested in the DAPL. The momentum from this victory was followed by another, as the City Council went on to pass a resolution against construction on the Keystone XL Pipeline. In the months that followed, divestment spread to San Francisco, Missoula, and several tribes, including the Muckleshoot tribe in Seattle, the Mille Lacs Band of Ojibwe in Minnesota, and Nez Perce in Idaho. Responding in part to the demands of DAPL activists, Portland, Oregon, chose to end corporate investment all together. And although they cited fraud instead of the DAPL in their announcement, New York City Mayor Bill de Blasio and city Comptroller Scott Stringer announced in late May that NYC would no longer work with Wells Fargo. Ready to get started? On top of the DAPL, there are several threatening pipeline projects across the country that are in the works, and each of these represents an extraction-based agenda that must be resisted. The website Mazaska Talks (or Money Talks) has posted a detailed overview of its campaign against the entire DAPL system and four additional tar-sands pipelines, including Keystone. The site also links to a Google sheet with the organization’s research on various cities around the country and a form you can fill out once you’ve got a campaign going and are looking to connect. You can also find some more pointers for launching your own campaign at DefundDAPL.org. Finally, to help get New York City to commit to divesting from all banks invested in the pipeline (Indian Country Today has said that the city, and its $165 billion pension fund, pose “perhaps the most potent threat to DAPL.”), you can contact Comptroller Scott Stringer here. After you’ve called your bank, go a step further and move your money all together. According to the website Defund DAPL, which has called upon “one million people around the world to close their accounts with banks funding the Dakota Access Pipeline,” personal divestment has amounted to over $82 million moved out of the banks that fund the DAPL. Moving money certainly sends a message the DAPL investors will understand. Norway’s DNB Capital and the Dutch bank ING have already withdrawn from the project. Divesting your own funds also has the added benefit of allowing you to support businesses that deserve it; a number of credit unions and banks are not attached to the fossil-fuel industry and many are owned by indigenous people. The Indian Country Media Network has compiled lists of indigenous-owned banks and credit unions. Yes! magazine has put together a guide for finding a bank that is not invested in the DAPL. The Black Out Coalition has provided a map of black-owned banks and credit unions across the United States. There is also a growing movement to establish public banks, which would be directly accountable to the communities they serve. Defenders of Mother Earth-Huichin has compiled a document detailing the relative merits of public banking as a tactic for supporting indigenous struggle and the transition from a fossil-fuel-driven, extractive model for the economy. In addition to providing key information about the role of the banking system in tying people’s wealth to projects like the DAPL, they stress that divestment is only a first step and that transitioning away from the pernicious effects of the extractive economy will only be possible when divested wealth becomes part of a strategy to reinvest in indigenous, black, and poor communities. Of course, the issues at the heart of the fight against the DAPL have been with us for years—and so have many of the organizations at the forefront of that struggle. Here are just a few of the organizations to follow if you’re interested in divestment campaigns and other organizing at the intersection of environmental justice and indigenous sovereignty. 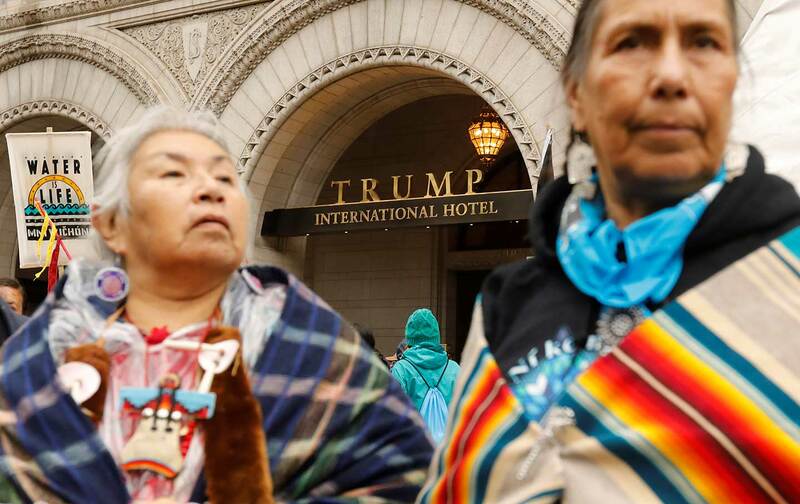 § The American Indian Law Alliance sponsored some of the actions in New York. The organization is dedicated to advocating for Native Americans at a national and international level. § NYC Stands With Standing Rock is a committee of indigenous scholars, activists, and their supporters who provide a syllabus for the DAPL in context of historic abuses against indigenous people in the United States. § The International Indian Treaty Council sponsored the Wells Fargo encampment and march on City Hall encampment on April 5 and 6. § The Bold Alliance is a network engaging in nonviolent direct actio INDIGENOUS PEOPLES RIGHTS n against installations like the Keystone XL pipeline, the DAPL, and the Bayou Bridge extension, which is connected to the DAPL by another pipeline. § The Bakken Pipeline Resistance Coalition in Iowa (the Bakken Pipeline is another name for the DAPL) is organizing a resistance flotilla of kayaks and canoes against the DAPL on June 17. § Earlier this year, the Indigenous Environmental Network assembled a list of 10 struggles against pipelines that need support. Links for making contributions, following developments around the projects, and to organizations’ social media are included. § Idle No More SF Bay has been holding nonviolent demonstrations since 2014 that raise awareness of dangerous refinery activity in the Northeast San Francisco Bay and the need to transition away from fossil-fuel-extraction economies.